Polypropylene (PP) is the second most important standard plastic after polyethylene, compatible with many processing technologies, and used for the most diverse applications ranging from packaging to household appliances, clothes, and vehicles. 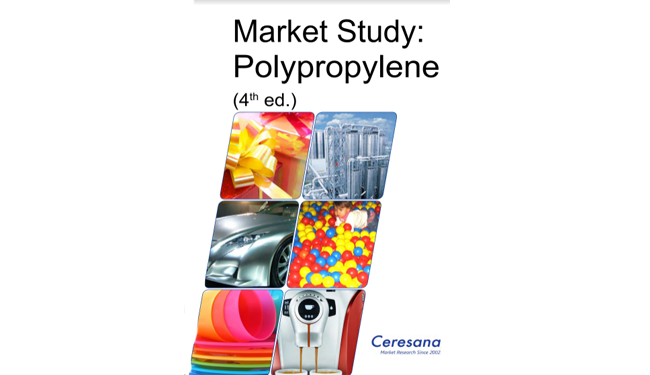 Ceresana analyzed the global market for polypropylene already for the fourth time. The latest report of the market research company expects the demand for this type of plastics to grow by, on average, 3% per year until 2024. Chapter 2 examines the 27 most important national markets individually. Besides seven EU states, countries like Russia, the USA, China, India, Japan, and South Africa are also included. Data on demand, revenues, trade, production, and capacity are provided for each country. Furthermore, demand is analyzed in regard to the individual application areas, product types (homopolymer / copolymer), and processing technologies (injection molding / films & sheets – extrusion / other extrusion / other technologies).